We set up Ceylon Sliders right here in Weligama Bay as it’s the centre of surf culture on the south coast of Sri Lanka. Surrounded by some of the most amazing surf spots in the world, come have fun with us in the surf – from catching your first wave to learning all aspects of the surfing lifestyle, we’ve got you covered with lessons for all levels, guided surf sessions and board rentals. 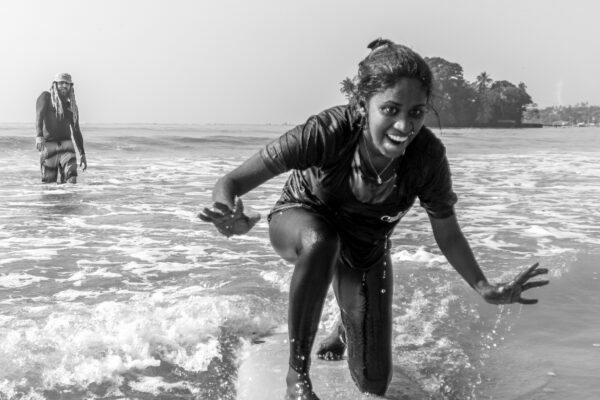 At Ceylon Sliders Surf School in Weligama, you can be flexible with how many surf lessons you want to do and at what times. We provide lessons for guests who are staying elsewhere as well as for our in-house hotel guests. Choose between a range of surf lessons or lesson packages, guided surf as well as rental surfboards in all shapes and sizes. Safety and fun through progression are our ideals and we pride ourselves with doing great beginner lessons as well as being able to provide more technical surf coaching for the surfer who feel like progressing in a certain aspect of their surfing. We have instructors and guides that are registered with the International Surfing Association (ISA) or similar and trained in surf rescue. All ISA lessons are progressive and have a specific focus to help you build a functional allround understanding of surfing and the ocean – every surfer is unique but with our methodology, it’s possible to progress through Level 1 (fundamentals) to become a Level 2 (developing) surfer in 3 – 5 lessons. Private or group lessons can be held in your choice of English or Sinhalese. Weligama beach just out front is home to the best beginner waves on the island and in our preference – all of asia. We have perfect gentle beginner waves all day, every day – year round. If you want to adventure further and explore more waves past Weligama, Ceylon Sliders is located in the midst of the surf mecca of Sri Lanka. All the best waves are just around the corner, Mirissa, Midigama, Ahangama, Hikkaduwa, Madiha, Unawatuna, Matara – every little point or reef has a wave that just needs to be surfed. Load the boards on a tuk tuk and head out to explore. Learn how to surf in some of the friendliest waves in the world with the help of our ISA qualified surf coaches. Catch your first waves just in front of the hotel, surf teachers from our surf school Sunshinestories will take you out and get you up and standing in no time. Learning how to surf is for everyone and the feeling of sliding across the ocean is incredible. At Weligama beach just in front of Ceylon Sliders we have some of the best surf conditions in the world for a learner. You have never surfed before or you have had a lesson or two or you haven’t surfed for sometime. You might be able to stand up and ride whitewater waves but you have limited skill or experience at paddling out to the unbroken waves. You want to get a feel for surfing; you will learn the fundamentals of surfing – with these skills and experience you will begin pushing ‘outside’ to unbroken waves. Have you been surfing for some time, but feel like you struggle on the board? The developing lesson might be the best thing you’ve ever done. Our surf teachers will help you get over any obstacles you have and maximise your progression. We’ll take you to the best suitable surf spot for your level and requirements on the south coast and help you progress in your surfing as well as having a good time together. You can handle your board and paddle out the back and ride unbroken waves successfully most of the time. You might be able to perform some basic moves like cutbacks or little floaters on whitewater sections. You want to push your limits; you will finetune your paddle, stance and style and begin developing more radical manoeuvers surfing both frontside and backside. The level 3 lessons are for available for longboarders and shortboarders alike that want to take their surfing to the next level – we’ll match you with the best coach depending on what your expectation of the lesson and preference of board. Have you been surfing some time, maybe even for a few years but feel stuck in your progression? With the level 3 lessons, we’ll take you out and analyze your surfing to pinpoint what you need to do to progress into becoming a styling longboarder or frothing shortboarder. Our surf teachers will take help you get over any obstacles you have and maximize your progression. We’ll take you to the best suitable surf spot for your level and requirements on the south coast and help you progress in your surfing as well as having a good time together. You’re an experienced surfer and can surf a wide range of conditions with confidence without the help of an in-water coach. You consistently trim, know how to generate speed or stall, perform basic moves and are at least attempting more advanced ones. You can handle yourself in crowds. You want to develop your board skills; you will work on perfecting your bottom turns or your stall to cross step, turning cutbacks into round houses or dropknee cutbacks, pushing top turns into airs and barrels or push towards the nose – cheater five’s, hang fives and hang tens. Our surfing taster is great if you are on a budget and just want to get a quick taste of surfing. Being just 60 minutes and held on the beach in front of the hotel, the lessons don’t include the more technical aspects as our ISA lessons. The lessons are taught by one of the local surf instructors on the beach which do not have ISA qualifications and are not trained in Sunshinestories Surf methodology. We have a quiver of surfboards for rent available at Ceylon Sliders in Weligama for full day or half day rental. Save money on airline fees and the hassle of bringing a surfboard, rent a surfboard form us and leave your own surfboard at home. Our surfboards are from some of the best international brand and are of highest quality. Rent a longboard in Sri Lanka, rent a shortboard or a soft top, we carry a small range of surfboards in different sizes, choose depending on your preference and ability. For some waves it’s better with a shorter board and at other surf spots you might want a board a bit longer. The right board also depends on your ability, how much you’ve surfed before. Talk to our surf teacher and they’ll will help you pick the right board for you on location in Weligama. If you want a specific surfboard for the your entire stay it’s possible to book it in advance. With our all-inclusive surf guiding our surf guide will meet you in the morning and take you to the best surf spot depending on the conditions as well as your ability and preference. Our surf guide will show you some of our favorite beach and reef breaks and try to beat the crowds. Before getting in our guides will brief you where to get in and out of the water as well as any hazards that’s good to know of. Our surf guide will also come out in the water and surf with you. 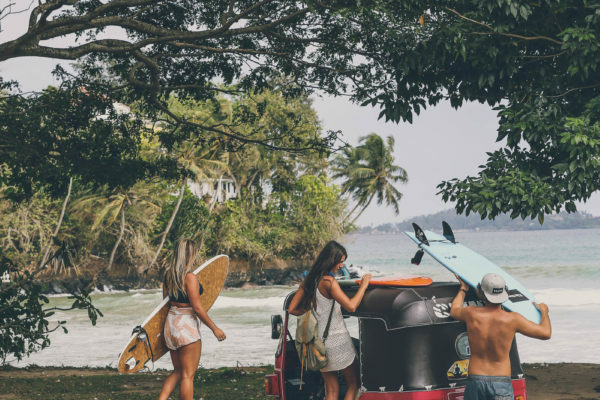 Surf guiding is great if you want to explore out of Weligama and make the most of your surfing holiday but not sure where to go and avoid spending unnecessary time researching before your surf trip. We recommend guided surfs only for experienced surfers who can easily catch their own waves and simply want to be introduced to a new spot somewhere in southern Sri Lanka. For our room guests, you can bill to your room and pay upon checkout. For outside students, please pay in the shop 48 hours in advance of lesson start to confirm the lesson. Where does the lesson start? It starts outside the shop of Ceylon Sliders. Please be there 5 minutes before lessons start. Can we meet at our hotel? Unfortunately not, we think it’s best to start at Sliders so that we can check out the boards, the gear etc on location before heading out. What spots will we surf? It all depends on your skill level, preference and what the ocean does in that particular moment before heading out. We will decide the spot on the day itself to give the best possible opportunity for a fun surf! Can you teach kids to surf? Yes we can! Please note kids age etc in the booking form. If you want a full on Surf Camp in Sri Lanka we recommend our sister company, Sunshinestories Surf Camp & Yoga Retreat in Ahangama. At the retreat we will work with your surfing through an all inclusive one week experience including surf lessons, theory lessons and daily video analysis with our experienced surf coaches. The surf coaching is extensive and we’ve developed our own tools and our own methodology to teach surfing in a fluent, simple and fun way. Every day is based around a different topic and we dedicate about 5 hours daily to on surf teaching. At Sunshinestories you’ll get a foundation for your whole surfing and get the tools to progress on your own after your stay.